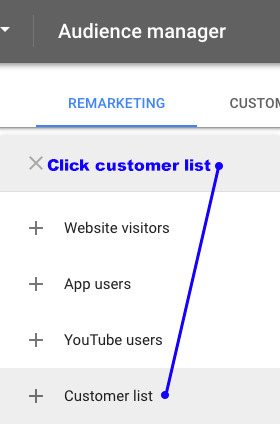 Google Customer Match allows you to serve ads to customers from your email list. Customers in your email list have already expressed interest in your product or service so these customers are more likely to engage. Remarketing customers in your email list tends to lead to higher click through and conversion rates since the users are familiar with your brand. Let's take a look at what it takes to upload your email list, create audiences and start remarketing today. The following steps assume you already have your email list data available and segmented. 1) Click the tool icon in the top right corner of your screen. 2) Under the section labeled “Shared library” click Audience manager. 3) Click Audience lists from the Page Menu on the left. 4) Click the plus button to create a new audience list. 9 ) Click "Choose File"
11) Set a membership duration. The default membership duration is unlimited, but you can set a custom time limit. 12) Click Upload and create list. 13) You can view the progress of uploading your data file under "Audiences Lists". This process may take take up to 48 hours to complete. 14) If your ESP is not able to automatically submit lists to AdWords then you'll need a process to update these lists regularly. We suggest once a month for most companies as a starting point.